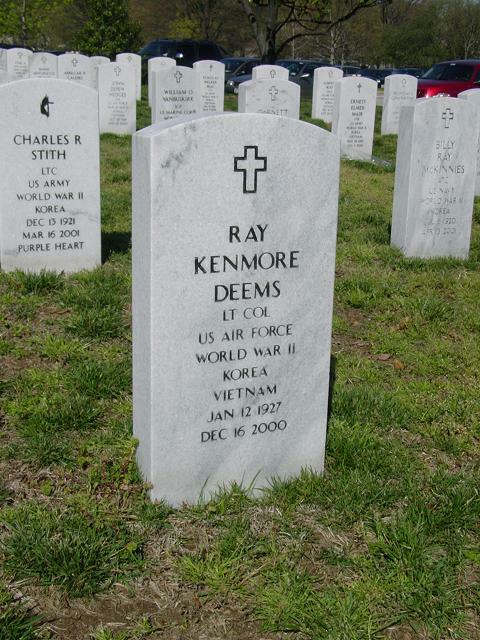 Ray K. Deems, 73, of Bexley, Ohio, died peacefully December 16, 2001, at his residence surrounded by his loving family. He was born January 12, 1927 in Crestline, Ohio. He is survived by wife of 42 years, Dorothy; 3 children, Charles (Laura) Deems, Julia Deems (James Cummings), and Bartley Deems; 2 grandsons, Alexander and Noah Deems; sister, Elverda (Paul) Emmer; brother, Jeff (Bonnie) Deems; and numerous other family members. He was preceded in death by parents Juliana Weber Deems and Charles Edgar Deems; sister Cora Mae Bletz. He was a realtor in the Columbus area for over 50 years, he had been President of Deems and Associates, Realtors, since 1970. Earlier he was a partner with Friedman-Deems, Realtors. Growing up in Crestline, he was a Boy Scout and later an Eagle Scout. While attending the Ohio State University, Ray was a member of the marching band. During World War II, he served in Nagasaki, Japan, with the U.S. Army's 97th Infantry Replacement Division, which later became the 25th Infantry Division. He joined the Ohio Air National Guard in 1948 and served with the 55th and 121st Tactical Fighter Wings. He was active in Etain, France, during the Berlin Crisis and later at Wright-Patterson Air Force Base during the Pueblo Crisis. After 32 years of service, he retired as Lieutenant Colonel in 1979. Ray was a kind and gentle man with great intellectual curiosity. He had been a member of First Community Church since 1966. Memorial service to be held at 3:00 p.m., December 22 in Burkhart Chapel at First Community Church, 1320 Cambridge Boulevard, Marble Cliff with the Rev. Jim Long officiating. Interment to occur at a later date in Arlington National Cemetery.